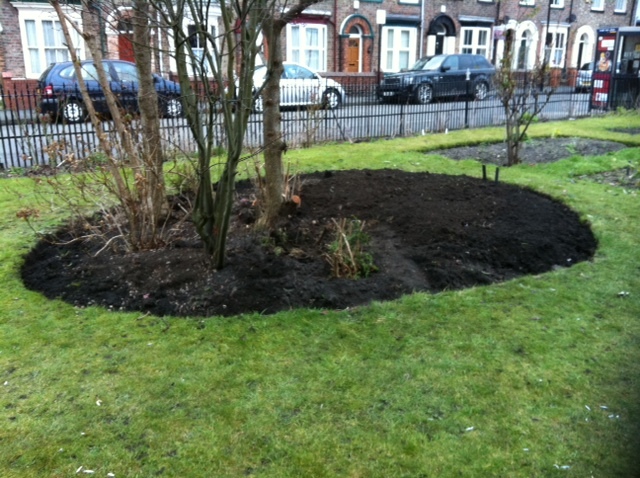 Lots of hard work, mostly by Giles, has created this new bed, on the south side of the ornamental cherries. This area was over-planted and crowded, with about a dozen shrubs, as well as the trees which are still there, so the shrubs have been moved to new locations and the trees pruned back to let light in. Today, Keith, Cath and Giles worked to empty out some of the compost bins, bury the compost in a bean trench and finished off this new bed, so it looks enticingly ready for use. Now, what shall we plant here? Come and tell us what you’d like to see here, perhaps during one of our Saturday morning sessions (the first is 2nd March).